Villa Muraia prende il nome dalla posizione in cui si trova, sulle mura di cinta del borgo medievale di Radicondoli, paese straordinario dal punto di vista paesaggistico che storico, dove è ancora possibile ancore di respirare vera accoglienza e veri sapori della Toscana. Meta ideale per visitare le vicine località di interesse mondiale come St. Gimignano, Volterra, Siena, Firenze. Perfetto per gli amanti del trekking, della mountain bike e del campo da tennis, la distanza a soli 50 km del villaggio di mare 'Punta Ala' e 'Castiglion della Pescaia'. Appena ristrutturato, il residence offre una calma e una convenienza senza eguali. Infatti, nonostante si trova in pieno centro storico, è circondato da un parco di oltre 1000 mq, in cui un ampio frutteto estende, completamente recintato per garantire privacy e comfort ai nostri ospiti. L'entrata è indipendente e la villa è dotata di parcheggio riservato. Gli interni sono caratterizzati da due aree distinte, entrambi forniti di camera matrimoniale e bagno, che si riuniscono nella sala principale dove si trova una nuova cucina attrezzata con forno e lavastoviglie. La porta a vetri ampia che si affaccia in avanti il ​​panorama circostante, disegna un quadro nel soggiorno zona in cui i nostri ospiti potranno rilassarsi in essere davanti al camino, con divani, tv e hi-fi. Dalla splendida porta di vetro che scende sulla terrazza dove è possibile cenare o bere solo un bicchiere di vino una bella cartolina panoramica dove, nelle serate limpide, lo sguardo perso sulla valle del Cecina e Val di Val d'Elsa, fino a Volterra e San Gimignano. Non si può perdere momento del tramonto, quando le luci dei vicini sobborghi accendono, e tutto diventa magia. This little house is so wonderful. The view is absolutely stunning... the town is cute and locals are nice. The host's mom greeted us and was very sweet to get us settled. The interior is delightful, beautiful Tuscan furniture and decor. The bathroom with tub is just beautiful. 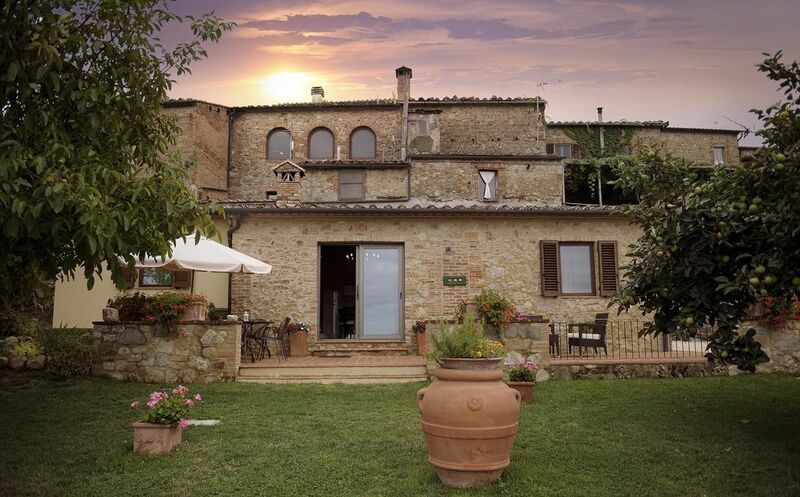 Day trips to other towns recommended, including Belmond - Castello di Casola. An incredible resort that you can enjoy for dinner or massage. I'd recommend this to friends. This was our second time staying at Villa Muraia and we hope to return again. The cottage is spacious, well-equipped, comfortable and nicely decorated. The view of the valleys from the terrace and yard is spectacular, and it is a wonderful, quiet place to enjoy the view and relax. It's a very short walk to the nearby restaurants, markets and the lovely old streets of Radicondoli. It's not too far of a drive to the more well-known hilltowns of Tuscany, and this makes it a nice base from which to explore the surrounding area. We absolutely loved our week-long stay! Beautiful house and view. The perfect holiday. Fernando and Pasqua, the owners, were always there to help. Very central location in the magical village of Radicondoli. Highly recommend. Wow, Wow et ReWow ! Nous venons de terminer un séjour de 5 jours en Toscane dans la maison de Federico à Radicondoli. Que dire de cette maison qui a répondu à toutes nos attentes et bien plus ! Tout est très bien divisé avec les chambres à coucher aux extrémités et cuisine, salle à dîner et salon au centre. Il y a 2 restaurants situés à 2 minutes de la maison et Le Pergola est vraiment à conseiller. Nous avons visité 4 vignobles qui étaient tous situés à 50km de la maison. Un gros merci à Federico qui a toujours répondu très rapidement à nos demandes lors de la préparation de ce voyage de rêve. On arrival we were met by Federico and his charming wife and two children who had waited patiently to meet and greet us at his beautiful Villa following our trip in the dark from PISA airport.We were given a brief tour of the property before thanking Federico,his wife and two boys and retiring for a much needed nights sleep. The next morning we awoke to the amazing vista of the Tuscan countryside from the Villa garden and the beautiful view of the large Radicondoli church. Radicondoli is a beautiful little town in which to base oneself to discover the delights Tuscany has to offer.When shopping at the local bakery and supermarket we were made to feel very welcome by the staff serving us on our daily visits. Dining out in Radicondoli was a delight and we visited three of it,s restaurants one of which we visited three times due to the wonderful food and the warm welcome we were given. A thoroughly enjoyable stay in a superb Villa in a great setting.I would recommend this holiday to everyone.David from Yorkshire. If you don't mind to drive at least 30 minutes to visit Tuscana, Radicondoli is really a good spot to live. Really charming village with good and friendly restaurants. Regarding the house, all is perfect, very pleasant and comfortable with an absolute awesome view from the garden !!! If I'm planning to go back to Tuscana I will definitely come back to Frederico's house. He and is father are really nice persons and help you for anything you need. So just... let's go !